Brent crude oil closed at $62.79 a barrel on Wednesday on renewed Saudi airstrikes and fighting in Yemen. UPDATE: Brent passed $65 mark on Friday morning. Actually other oil producers will also be helped by higher oil prices, including Saudi Arabia, UAE... You'll help yourself much by not regarding every single development in the world in terms of favoring or disfavoring Iran or Russia; not every issue is ideological! So why did the Saudi flood oil markets and refuse to cut production in the first place? Obviously they weren't going to benefit from free-falling oil prices! Of course I agree that we shouldn't view everything in terms of favor or disfavor to Iranian interest, that would be childish, but the Saudis have little reason to lower the income of about 90% of their exports unless they knew it was going to hurt Iran (and to an extent Russia) more than it was going to hurt them. Right? 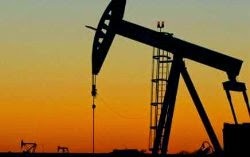 On your point about Saudi role in lowering of oil prices: the Saudis did flood the market some months ago to keep U.S. shale oil producers from grabbing increasingly larger market share, and of course their strategy also put Iran in a financial bind, so they achieved two goals at the same time, even though they had to accept less revenues from their own oil exports in the meantime, because they could afford it and U.S. shale oil producers and Iran could not. But I have a hard time to understand your questions above. What are you trying to say about oil price rise today? Nothing. I was talking about their former policy of flooding oil markets and how Obama openly came out and said it was to pressure Iran and Russia, even though you say (rightly, I would think) that it was to compete with American shale oil companies.